A worthy companion, mindfully crafted for a home’s most intimate space. 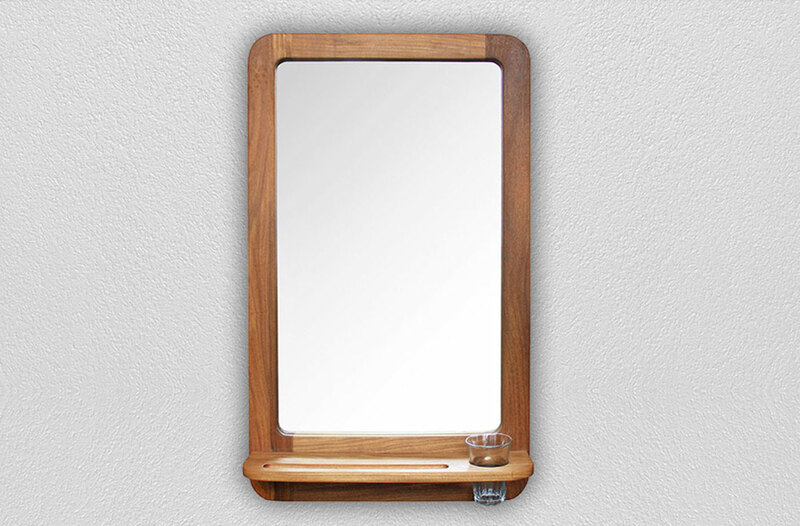 The Afromosia Mirror is a bathroom vanity mirror named for the timber used to produce it. It started out as one of several bespoke residential design elements for a high-end interior design project, namely House Ebenezer. Ebenezer Dam lies in the lush subtropical ‘Land of the Silver Mist’ on the Groot Letaba River, near Tzaneen in Limpopo. It is here that AB Design was fortunate enough to work on the House Ebenezer project which included the creation of the humble Afromosia Mirror. It started out as one of several bespoke residential design elements for a high-end interior design project, namely House Ebenezer. Today, however, the Afromosia Mirror is also an independent AB Design product. It has become quite a coveted piece in their collection that they are proud to showcase and continue to produce. The modern lines of this vanity unit borrowed from the harvest table design, specifically in terms of the characteristic square edges and angled legs. It almost effortlessly complemented the selected portrait styling and understated, yet defining ledge. The desired ability to view the reflection of one’s head and (majority of) one’s torso guided the chosen standard dimensions of the Afromosia Mirror. Although the House Ebenezer project initially provided the opportunity to develop this particular piece, the AB Design team soon envisioned a place for this design beyond this one home and even beyond the specific room it was originally designed for. A sufficient amount of research and time went into sourcing and testing materials in order to determine which had the attributes necessary to satisfy their quality standards and performance expectations. AB Design is always excited about this step in the process since the material they eventually decide to use becomes the embodiment of their vision. Teak is typically considered for a piece of this nature and it was specifically Afromosia, also known as African teak, that met all their requirements at the end of the day. Apart from being the chosen timber for the mirror, they decided to keep the name for its mysteries allure. Afromosia, also known as the African teak, thrives in moist, semi-deciduous African forests. 100% Solid Wood. One of the main reasons AB Design used Afromosia for House Ebenezer’s bathroom vanity mirror is because of its natural ability to thrive in humid conditions. It was a requirement in terms of the geographical area and interior space it would occupy. Once an Afromosia Mirror has been produced, it simply receives one protective application of Rubio Monocoat, a unique water-based sealant produced in Belgium. After that, no further maintenance is required to protect or enhance the wood. The completed mirror features a ledge that acts as a resting place for lightweight items such as cosmetic tools. It also comes with a glass that of course fits the space that has been created for it. This is often regarded as an ideal spot for a toothbrush and toothpaste set, but there are no rules really. The reflective surface is standard mirror glass which has been rebated and inserted from the rear to conceal the edges which are not considered attractive. It comes with a pre-fitted hanging point which ensures simple and convenient installation. All you need is a basic masonry nail and a centre point to hang the mirror in place. The Afromosia Mirror has additional significance for the AB Design team as it is a strong representative of what an everyday interior object such as a mirror can be when given some consideration and attention. The South African market is still lacking strong equivalents, but it is clear that they have made an impact by bringing this piece to life. Afromosia Mirrors are made to order and can be shipped worldwide.